In honor of the way our generation has chosen to represent ourselves in art—and, as it follows, in life—I am lovingly filing The Runaways Lab’s latest production under “the millennial blood bath.” “The Party House” is part of a growing lineage of work that pushes art to the brink of good taste in order to capture the self-inflicted depravity of youth. Like burn marks on a Goodwill carpet, “The Party House” is the ghost of good times not so long gone. Sustained on a diet of beer and Brecht, “The Party House” has the feel of loose experimentation punctuated by moments of startling lucidity. It is a work of atmospheric realism bar none and is most convincing in the mode of observational detachment. Despite its length, the play might be better taken as a whole, avoiding the trappings of an act break and pushing through to its anticlimax. The distancing effects of spectatorship dissolve after a while and there is great pleasure in the feeling of real engagement that co-directors Olivia Lilley and Cheryl Nowlin are able to capture. 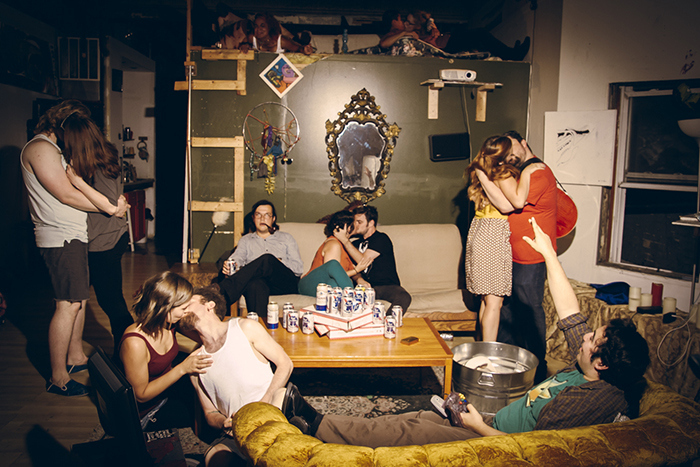 Though it seems strange to apply the word to an occasionally brutal work of art, there is something homey about “The Party House.” It invites you to sit on the couch, smoke a bowl or take a shot and, despite the aura of grime, you actually want to accept. “The Party House” intentionally blurs the line between autobiography and narrative in such a way that it becomes difficult to ascertain whether this play is meant to be nostalgic or satirical. Perhaps both: a hazy memory of early twenties liberation and a kind of gentle rebuff of post-adolescent indulgence. Beneath the grubby façade, there is real empathy in this ode to stunted growth. And real insight, too. The Runaways Lab, runawayslab.org, $15. Through September 27.